The roundtable was held on the eve of the General Assembly in London of the Consultative Group on International Agricultural Research (CGIAR). Founded in 1971, CGIAR is a consortium of global agricultural research centres aimed at reducing poverty and achieving food security in developing countries. It is made up of 15 centres including the International Livestock Research Institute, the International Water Management Institute, World Agroforestry Centre and Bioversity International. Africa is a world leader in poverty and hunger due to a lack of committed leadership and rampant corruption, said Dr Kanayo F. Nwanze, President of the International Fund for Agricultural Development (IFAD) in his address to the APPG on 7 December. On 2 November 2016, the APPG hosted the Global Panel’s UK launch of its Foresight report: Food systems and diets: Facing the challenges of the 21st century. The Foresight report sets out how the burden of malnutrition is equivalent to that of experiencing a global financial crisis every year. An estimated 3 billion people across 193 countries have low-quality diets which contribute to poor nutrition and health outcomes, while also slowing economic and development progress. The report outlines the toll that malnutrition takes on individuals, nations and economies today and forecasts the expanding costs and consequences if these trends continue. It provides a guide for governments and decision-makers to change course through action and investment to create food systems that promote health and deliver quality diets. 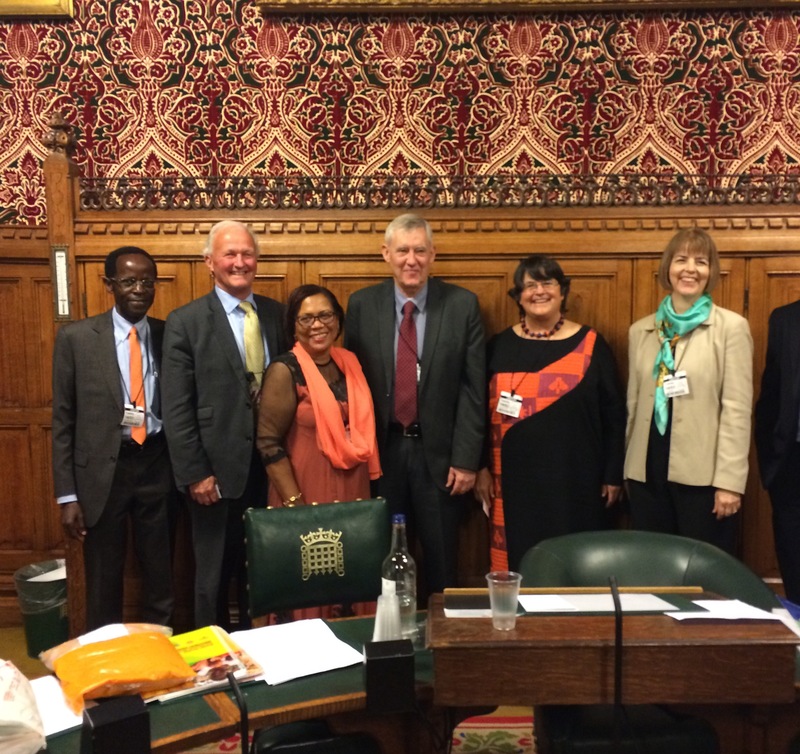 The APPG on Agriculture and Food for Development held its AGM on 18 October 2016. Minutes of the meeting are available here and an income and expenditure statement for 2015/16 is available here. On 29 June the APPG co-hosted an event with DFID's agricultural research team to mark the launch of a Brucellosis Vaccine Prize. The launch of this $30m prize - to incentivise animal health companies to develop a more effective Brucellosis vaccine - was an opportunity for the APPG to bring together a panel of experts to discuss the importance of livestock to livelihoods and food/nutrition security in developing countries. Click here for a full report of the event. From 2 - 7 April 2016, the APPG on Agriculture & Food for Development conducted a field study in Rwanda, together with the APPG on Trade out of Poverty. Agriculture is the backbone of the Rwandan economy, contributing 35% of total GDP. Almost all (90%) of the population depend on the sector for their livelihoods. And in spite of the great strides made by Rwanda since the genocide of 1994, rural populations still suffer food insecurity and poor nutritional outcomes. Access to inputs, problems of land tenure, climate change and access to value chains are just some of the issues stifling the livelihoods of Rwandan smallholders. On this trip, the APPGs - including several Parliamentarians - looked specifically at the challenges faced by women smallholders and cross-border informal traders in accessing markets, credit, technology, knowledge and training. A full report on the visit - with policy recommendations - is available here (PDF). 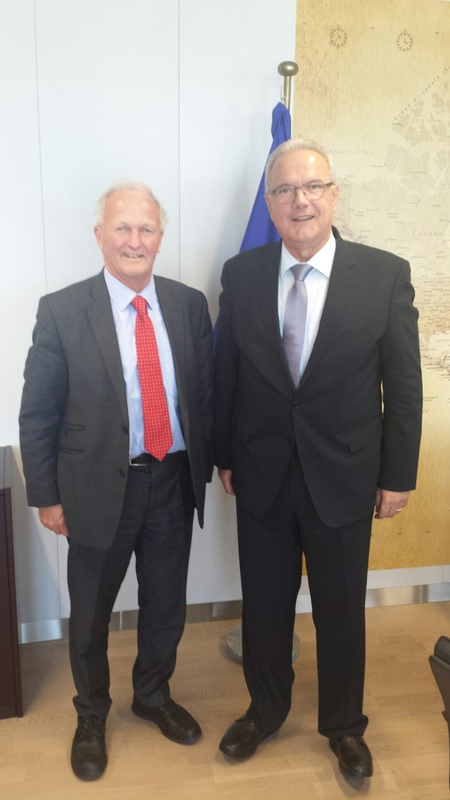 Lord Cameron of Dillington, co-chair of the APPG, visited Brussels for a day of meetings on 1st October. He met with Neven Mimica, European Commissioner for International Cooperation, Jean-Pierre Halkin, Head of Unit for Rural Development, Food and Nutrition at Europaid, Dr. Jurgen Anthofer, Executive Secretary for Agricultural Research for Development and the Secretariat for the Committee on Development in the European Parliament. The meetings focused on the importance of support for smallholder farmers to achieve the newly agreed Sustainable Development Goals and the role of profitable smallholder agriculture as an engine for growth in rural communities in sub-Sahara Africa. This article has been written by Francesca Fryer, Campaigns and Parliamentary Officer at Concern Worldwide UK, and has been published with permission from Concern Worldwide UK. Together with The All Party Parliamentary Group on Agriculture and Food for Development, Concern Worldwide convened a round table discussion in June to discuss how to tackle natural disasters and others crises that prevent the world's poorest people from lifiting themselves out of poverty. Building resilience means being prepared for the predictable disasters that affect communities, like climatic shocks. If we prepare for a disaster before it turns into a crisis, communities have a better chance of recovering quickly. And the research shows that it not only saves lives, but saves money too. DFID's own research in Ethiopia shows that for every £1 spent on building a community's resilience to prevent food crises, £8 is saved in future emergency response. See how resilience works in practice in our 'Resilient Village'. Resilience isn't something that can be imposed from outside; it's something that emerges out of collaboration with communities, experts, donors and government at all levels. Helping people to build their assets and their livelihoods so that they can pull themselves out of poverty and prevent themselves from falling into crisis is a collaborative process. Donor countries, national governments, local governments, local and international NGOs and the communities most at risk need to all work together to confront an increasingly hazardous world. Our campaign, Growing Resilience, asks governments to scale up funding for programmes that build community resilience to food crises. It also asks national governments in countries in East and West Africa to include resilience building in their national policy frameworks. Working together, we can tackle predictable and preventable food crises so communities can access sufficient, nutritious food. The round table opened up opportunities for us to collaborate further with the UK government and parliamentarians to tackle hunger by ensuring that the poorest communities are better prepared for, and can recover from, disasters. You can read more about what we're asking the UK government to do here. 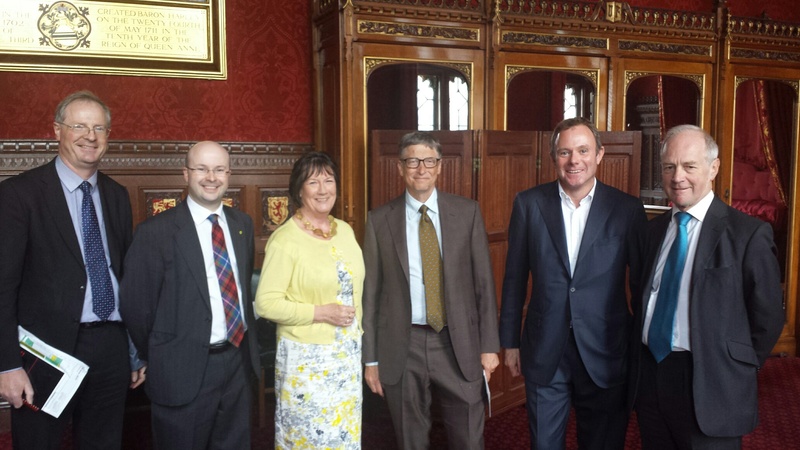 In his wide-ranging address to parliamentarians, Bill Gates thanked the UK government for their generosity and leadership and thanked the APPGs for their partnership and role in keeping parliamentarians engaged. During his address Bill Gates focused on health issues and achievements such as reducing the number of deaths from malaria by 50%, and talked about the importance of solving malnutrition, saying that until malnutrition is no longer an issue, Africa will not be able to become self-sufficient. Bill Gates also talked about the need to increase contraception in developing countries and the role of women's groups in achieving this, as well as highlighting how vitally important it is to create functioning tax collection systems to increase domestic resource collection and funding of public services. In an equally wide-ranging Q&A, Bill Gates answered questions centred on the role of data collection and transparency, the need for modern health care systems, the impacts of climate change on development and corruption. Lord Cameron (Co-Chair of the APPG AgDev) asked about the importance of knowledge sharing, access to knowledge and the role of ICTs for smallholder farmers. Bill Gates' responses agreed and in addition highlighted the importance of accessing seed, credit, adequate soil quality and land rights, as well as talking about the positive role that agro-dealers can play. The event concluded with the Speaker of the House of Commons, the Rt. Hon. 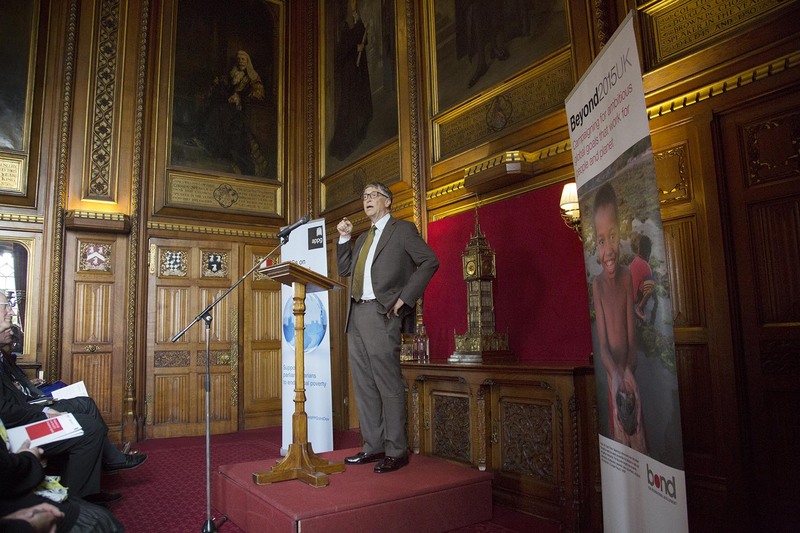 John Bercow MP thanking Bill and Melinda Gates and the Gates Foundation for their leadership and their commitment to ending poverty. Parliamentary Agriculture Committees - How can we support them?